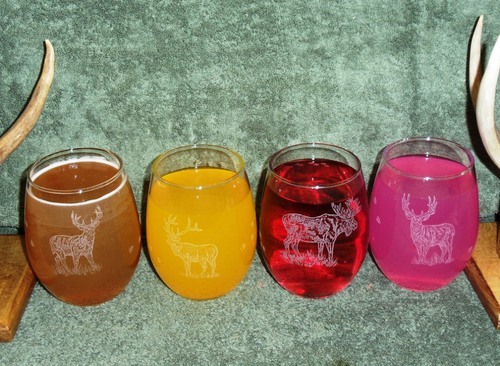 Set of 4 - Stemless Wine Glasses with 3 available sizes: 9oz., 15oz. (as displayed) or 21oz. Each piece is Sand Carved by hand for fine detail and deep etch decoration. Decorated with the Standing Elk, Whitetail Deer, Moose and Mule Deer, original artwork by Dann Jacobus.